Community Development Partners and Perlman Architects recently celebrated the opening of our newest affordable multi-family housing project with a ribbon cutting ceremony. 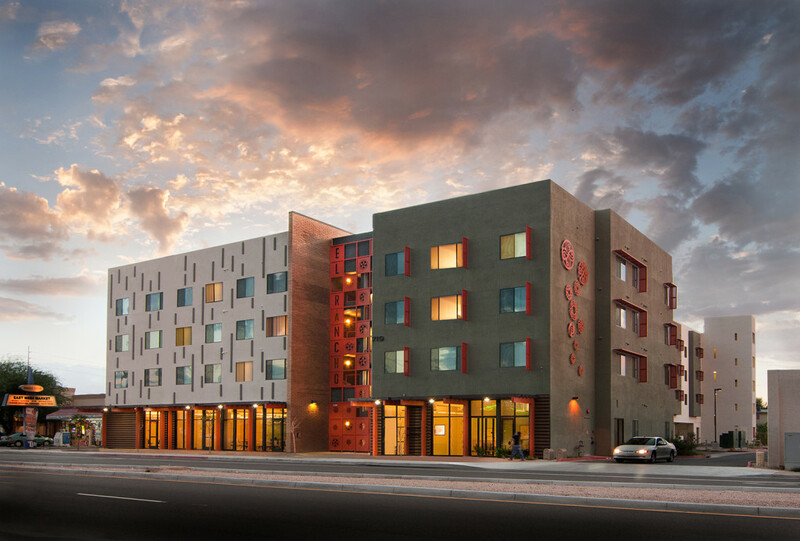 Located in downtown Mesa at 719 E. Main, El Rancho del Arte is a mixed use development that ties in 66 residential units with community spaces that include playgrounds, media rooms, community centers, barbeque areas, a series of community garden boxes, and a pool. These spaces, along with a number of other community oriented programs like adult educational programs and after school programs, will help to create a strong sense of togetherness within the neighborhood. Also helping to bring the project a strong identity are a number of public art installations throughout the site. Most notably, artist Zarco Guerrero, a long time Mesa resident, has helped design an element of the main facade of the building. By integrating a series of mandalas into the metal screen framework that covers the main stairwell facing Main street, Zarco hopes to provide creative inspiration and chance for contemplation. The mandalas reference ancient symbolism and tie the building and its residents to a shared history. Other unique aspects of the project that provide opportunities for it’s residents include immediate proximity to the light rail, substantial bicycle parking, and it’s location at the edge of the downtown mesa art walk, which gives residents a chance display community work to the neighborhood. El Rancho del Arte is a new hub in the neighborhood that combines high quality living spaces with community amenities that are a catalyst for the development of downtown Mesa.